Social media marketing has come of age. 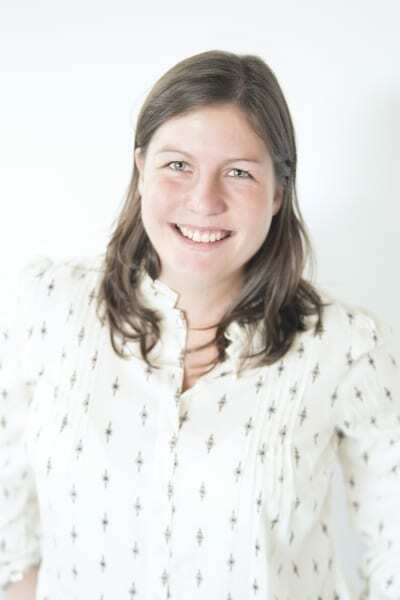 (Not interested in a quick overview of Facebook advertising? 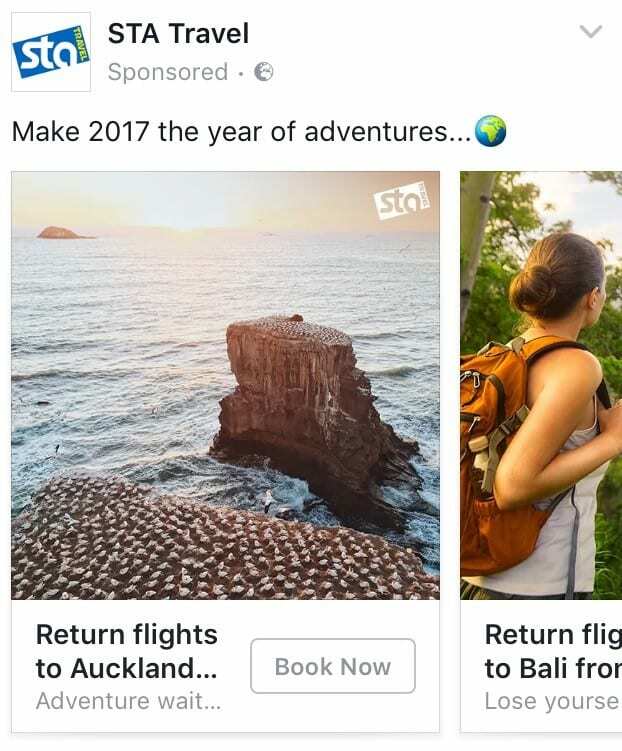 Scroll down to see the collection of Turn of Year Facebook Adverts). Do you know what Facebook Objectives, Formats and Placements are? No? Uh-oh! 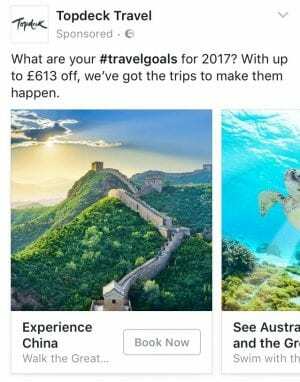 Facebook advertising is more sophisticated than ever, with no less than 11 different advert objectives. There are more than 20 different advert formats. The number of potential variations is staggering. 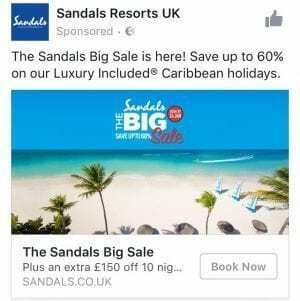 Have a look at the different advert layouts you are targeted with next time you’re scrolling through your Facebook Newsfeed; they are hiding there amongst the 56 identical pictures of your friend’s child, videos of cats and news about Donald Trump. 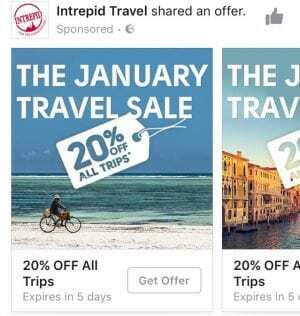 Facebook adverts now have six different placement options. 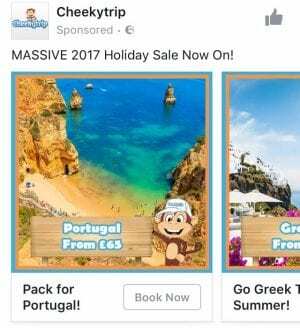 Facebook also trialled Facebook Messenger as a placement in December 2016 but it appears Mark Zuckers has taken that advert placement back to the drawing board. The last and most important thing to consider is Facebook’s vast targeting options. That magical mix of getting the right product, in front of the right person, at the right time, with the right message. That’s the land where social media ROI lives. It’s not a mythical land but it’s harder to find than Narnia if you don’t know what you’re doing. 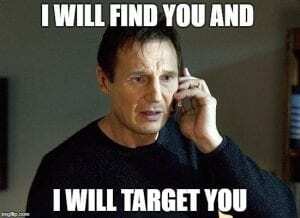 If you have a Facebook account and I have some basic knowledge about you there are good odds that I can target you. Scary, isn’t it? 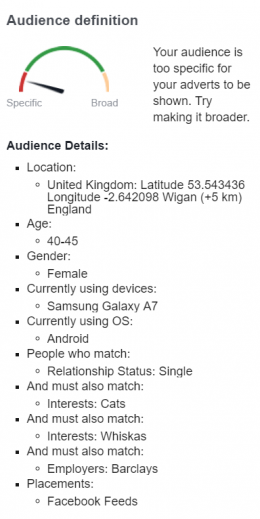 Facebook knows more about you than your mum does. It’s a marketer’s playground. The following have been collected from adverts targeted towards me and 20+ of my friends. 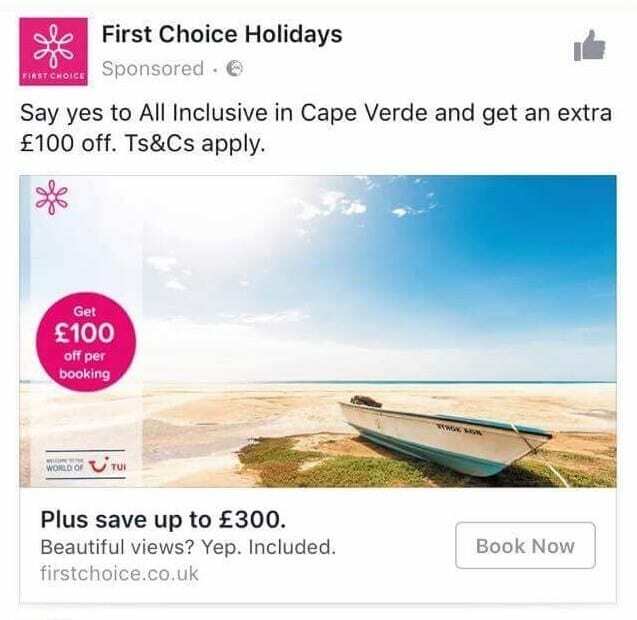 I currently have more than 100 turn of year Facebook adverts from more than 40 different holiday companies, including all the main players in the market. 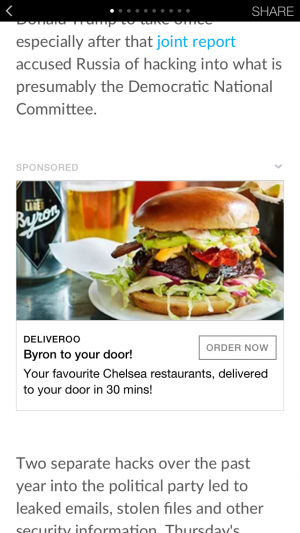 There is a higher percentage of OTA ads opposed to traditional brick and mortar agencies. 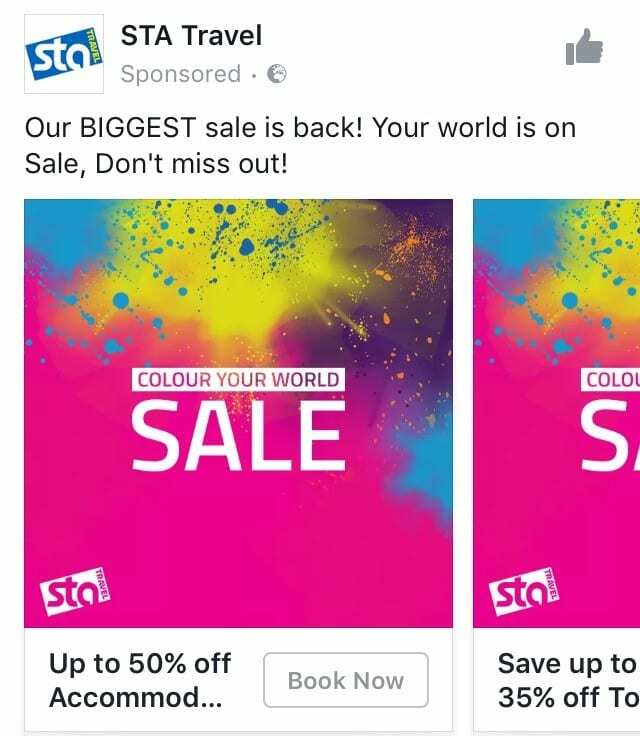 STA use minimal text, quality pictures and clean carousel adverts to promote their key sales messages and product offering. 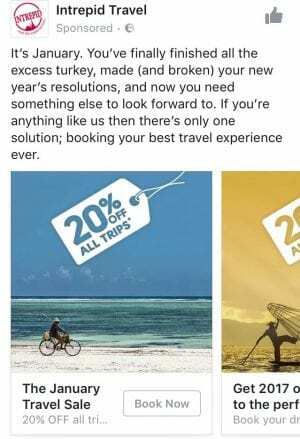 Similarly to STA, Topdeck use inspirational, visually-stunning, crisp carousel adverts which capture the wish fulfilment aspect of travel perfectly. Icelolly uses a traditional text and multiple image ad with an on-brand hero image. 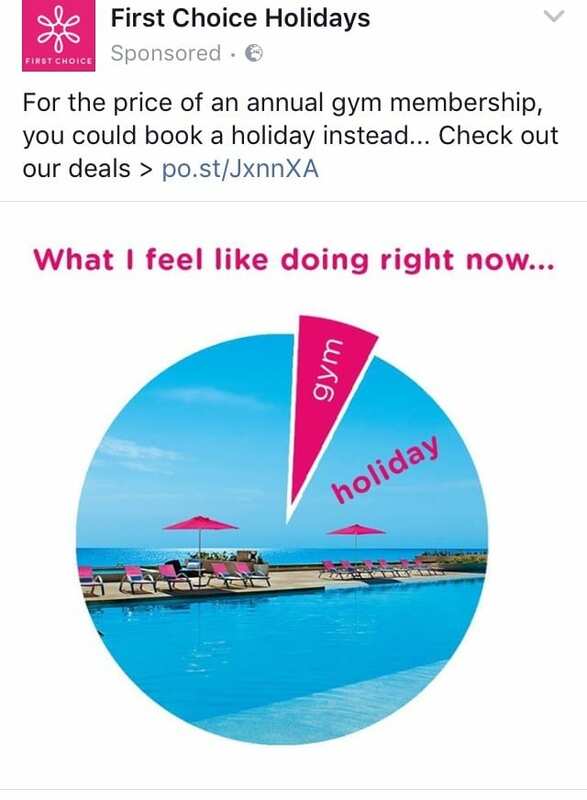 The advert has strong sales messages and utilises emojis effectively, making for an eye catching and engaging ‘sell off the page’ style advert. Interestingly for an OTA advert the ‘Marketing Objective’ isn’t to drive web traffic. 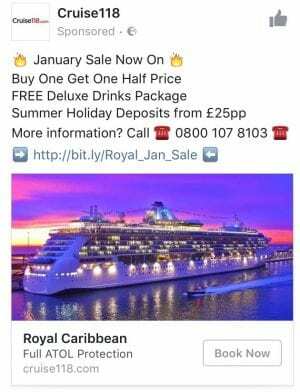 However it is possible for adverts of this style to out-perform carousel adverts on web traffic if the post receives a lot of engagement. Link clicks from adverts in this style also tend to be of better quality (e.g have lower bounce rates) the more time spent on the site etc. Simple, clean, interesting, on-brand carousel advert. 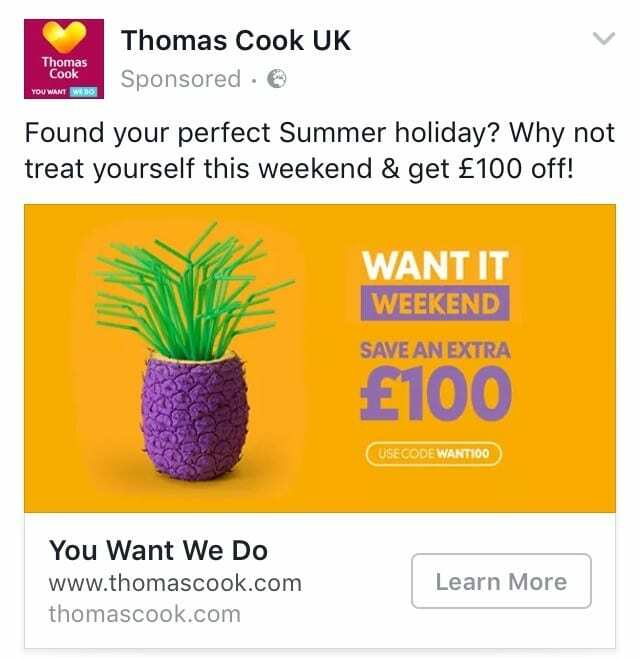 Clever image template overlay with the destination and lead-in price. 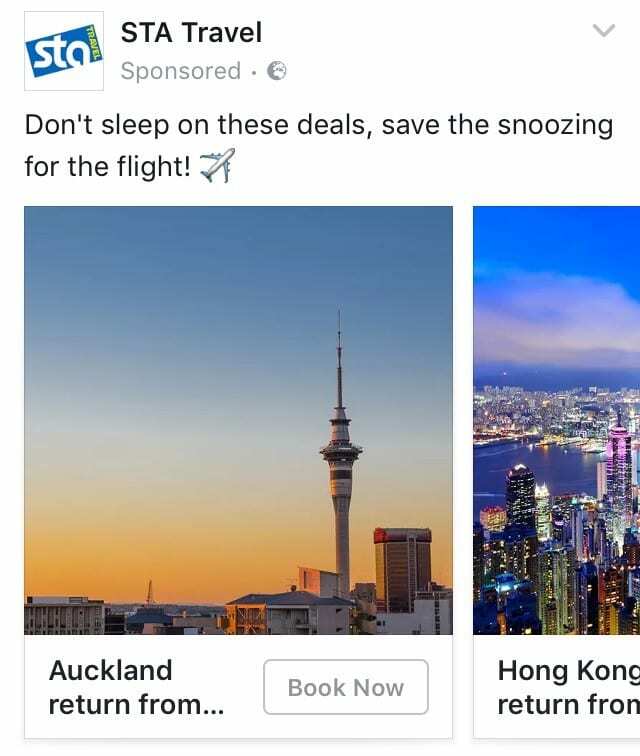 Same campaign, different advert objectives driving web traffic: ‘Book Now’ vs ‘Claim Offer’. Consistent messaging with differing calls to action. 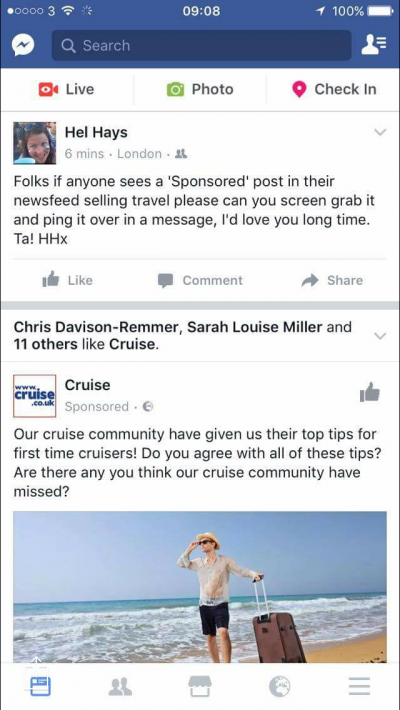 Strong sales-focussed advert from Cruise118. 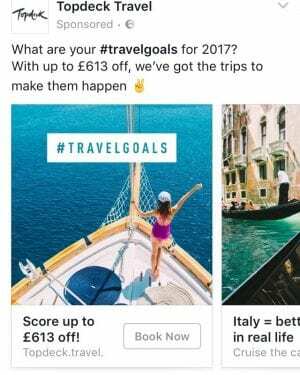 Includes all key sales messages, it’s immediately obvious what they’re selling, excellent image, good use of emojis and clear calls to action; all achieved without the advert being too cluttered. They managed to sneak ATOL protection in there too! 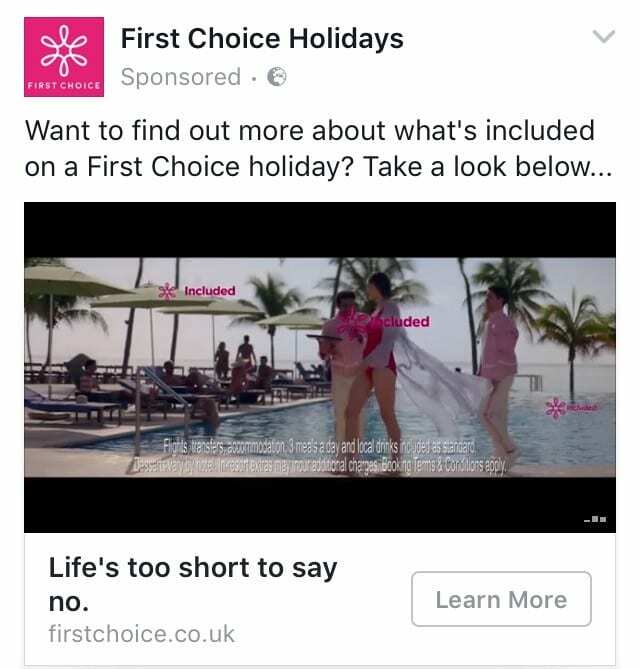 First Choice’s brand consistency is second to none. 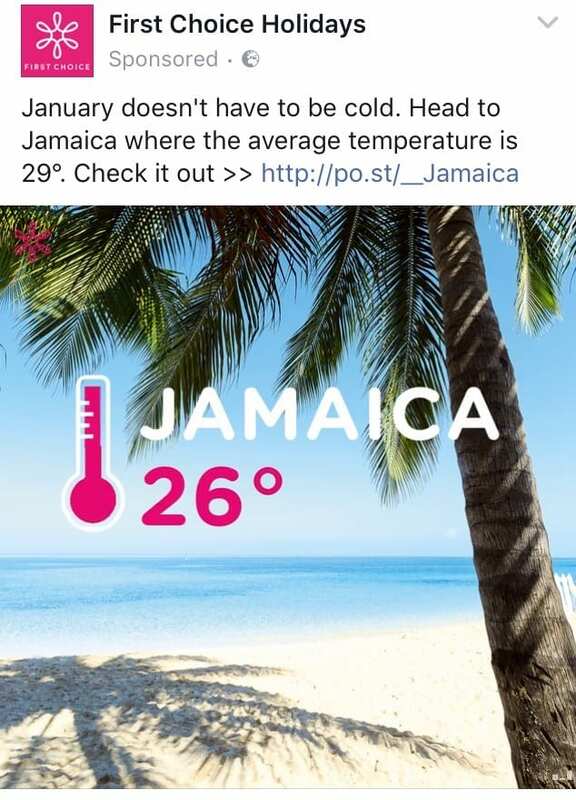 Their January social campaign included a multi-channel approach to support their wider campaign and TV advertising, engaging topical content and destination specific promotions. 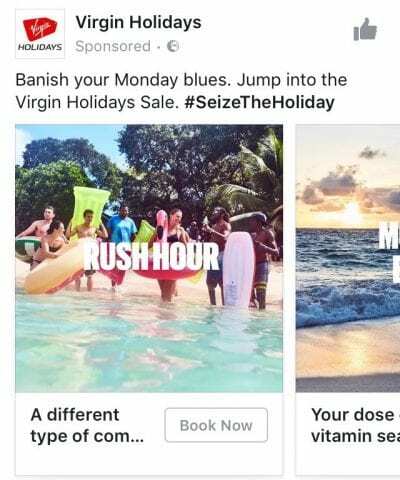 Facebook’s Newsfeed is a busy place, with users being subjected to hundreds of messages from friends, family, publishers, brands and companies daily. You need to grab the users attention and you need to convey your message and what you’re selling immediately. Travel is one of the most visual products in the world. 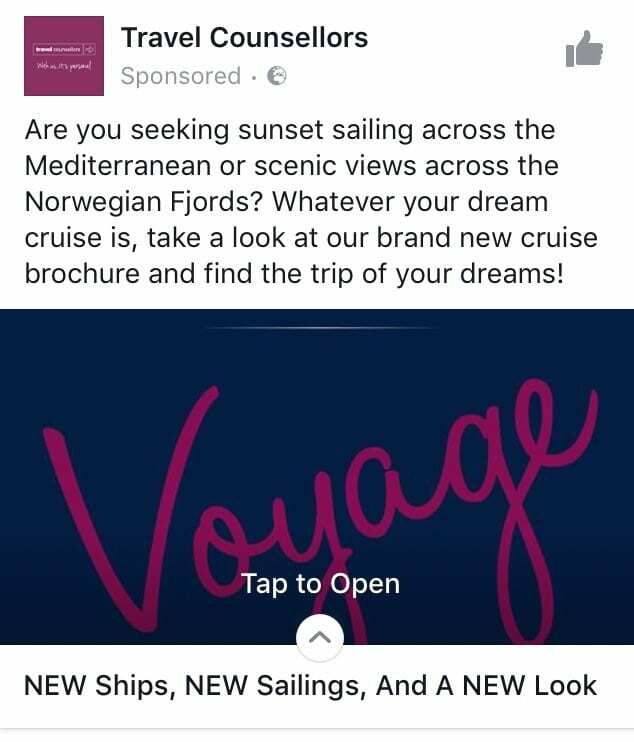 Do the following adverts say ‘travel the world’, ‘relax on idylic beach’, ‘have fun with loved ones’, ‘explore’ or ‘indulge’ to you? Look at the advert and blink. That’s all a user will see. Would you stop scrolling? This next one was sent over to me by a mother of two young boys. 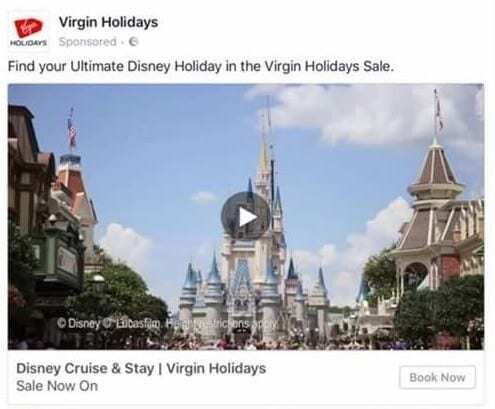 The targeting is spot on, and if a picture says a thousand words, a disney video would say 14,678,309. 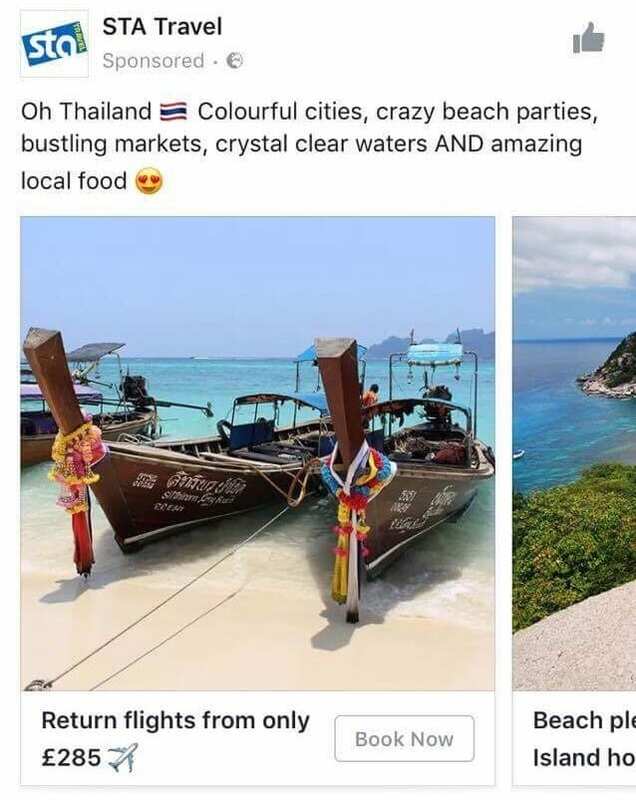 One of the amazing targeting options Facebook advertising has is the option to target friends of people who are engaged. The following was sent over to me by a male, young professional in his mid-twenties; a good demographic to target for Vegas. He also happens to be friends with someone who is getting engaged. He is his best man, in fact. Next. 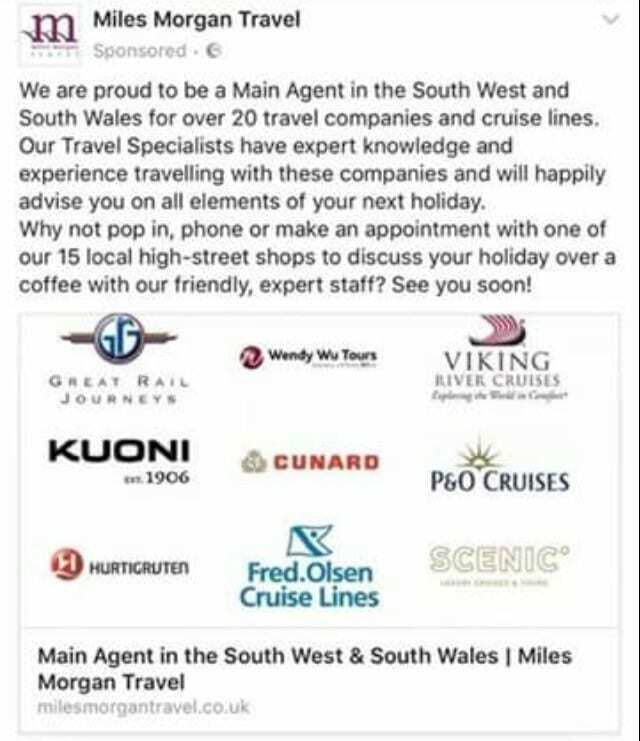 Targeted to Londonders on Monday 9th January when the capital was in travel chaos caused by a strike affecting the entire London Underground. Topical, real-time and relevant. Right product, in front of the right audience, at the right time, with the right message. 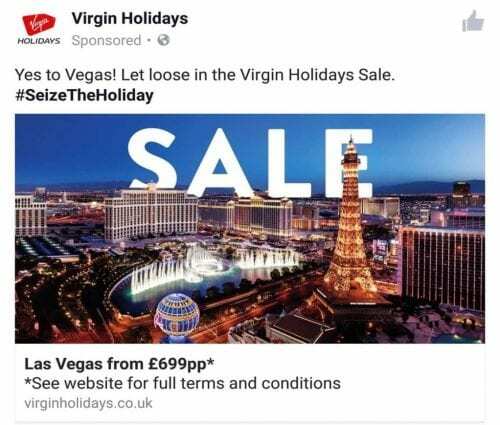  Virgin Holidays. 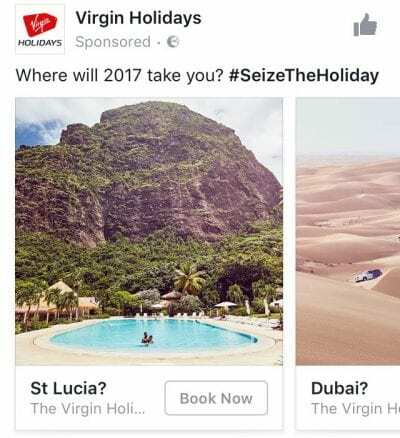 One thing that is for sure is that social media isn’t going away and currently (as of March 2017) Facebook advertising is the best place in paid advertising. Not just in social media advertising, not just in digital marketing, but in any form of traditional marketing. Anyone you are trying to reach offline you can reach for less, more effectively, with better tracking on social media. 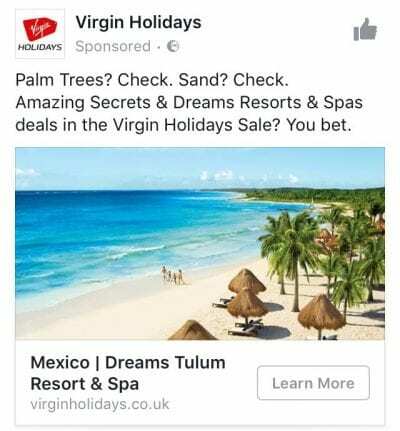 Want to know how to create killer social media campaigns which are as targeted as Virgin Holidays? Give us a ring and find out how we can help. Thanks to everyone who sent over an advert. N.B. 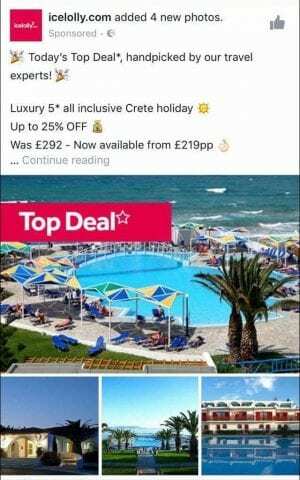 Advert information correct at time of publishing. Facebook will probably have made 17 changes to the platform while you were reading the above!